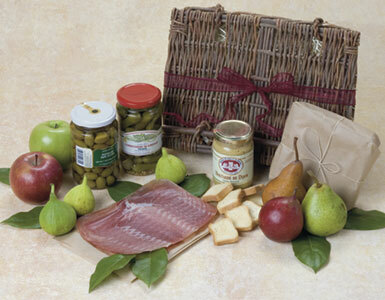 The Prosciutto Hamper contains six ounces of pre-sliced Prosciutto di Parma imported by Bussetto. It's complemented by olives, toast, pears, and figs, fresh when in season and dried at other times. We offer many gourmet gift including Prosciutto di Parma gift basket, basket of Prosciutto, gourmet Prosciutto basket, sliced Prosciutto basket, and gourmet Prosciutto di Parma basket. We guarantee prompt Prosciutto hamper and Prosciutto gift basket delivery in Beverly Hills, West Hollywood, Santa Monica and greater Los Angeles area.